The one fundamental question that has so far foxed us all is how to predict the results of football matches. Some Malaysian businessmen believe they have found a way but it’s notoriously risky and unreliable. Astrology has a method by way of the Contest chart. This involves casting a chart for kick off time, identifying which planet rules each team and judging their relative strengths. It has to be said that this is not an exact science and certainly does not work for the main bulk of games. It seems that the Universe is too busy sorting everyone else out to be worried about these, but just like all the rest of us, it is keen to sit down and watch a good old fashioned Cup Final. And when it does put its feet up in this way it loves nothing more than to create an upset. Here’s a few that it made earlier. The 2004 European Championship Final pitted the hosts and favourites Portugal against the ultra defensive outsiders Greece. Normally most neutrals are on the side of the underdog but not in this case as they were universally vilified for their way of playing which basically involved refusing to give up. Greece’s triumph was unexpected, considering that they had only qualified for two other major tournaments, where they failed to win a single match. Saturn is in detriment in Cancer but also combust and in conjunction with the 7th house cusp ( opponents house ). Portugal are weak and in the power of Greece. 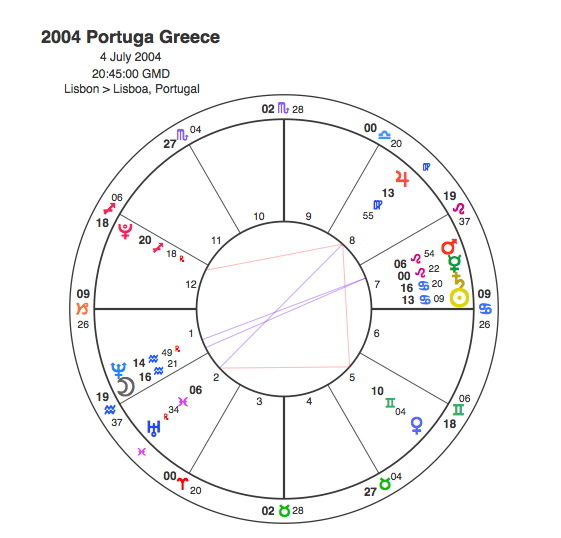 The Moon for Greece is not particularly strong in Aquarius and it was a sterile defensive performance. The Moon’s aspects show where the game is going to go. It is just past ( by one minute ) an inconjunct aspect to Saturn, so it’s leaving Portugal. Its next aspect is a sextile to Pluto ( often an indicator of a shock ). Possibly Mars in the 7th is another indicator of an upset. Greece to win which they did 1 – 0. This was not the first upset in a Euro Final as 1992 saw Denmark against Germany. Denmark hadn’t even qualified for the competition. Originally, Yugoslavia qualified for the final stage, but due to the Yugoslav wars, the team was disqualified and their qualifying group’s runner-up, Denmark, took their place. Denmark’s performance throughout the tournament made many people question whether intensive training was the best preparation as they all came in at the last minute to win having had a nice rest at home. Mercury for Denmark is at the end of Cancer. Cancer, of course has a strong connection with the family, so Mercury being right at the end of this sign, shows that the Danish team was lazing about at home until the last minute. 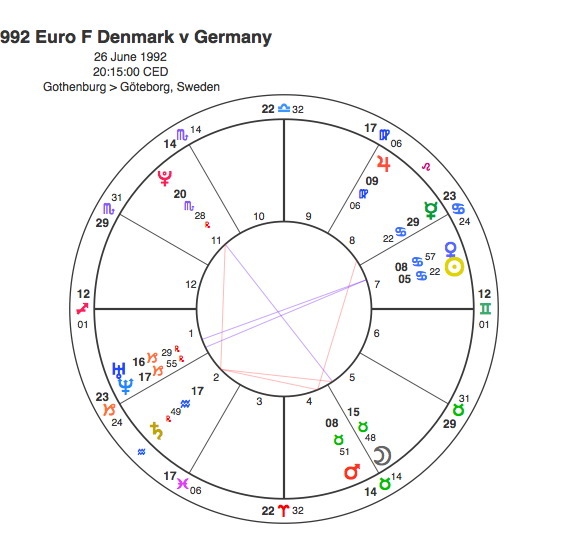 Jupiter for Germany in its detriment in Virgo. The Moon has left a trine aspect to Jupiter and is applying sextile to Mercury which would give it to Denmark. The Moon’s next aspects are to Uranus, Neptune and Pluto so a shock is on the cards. Denmark won 2-0. 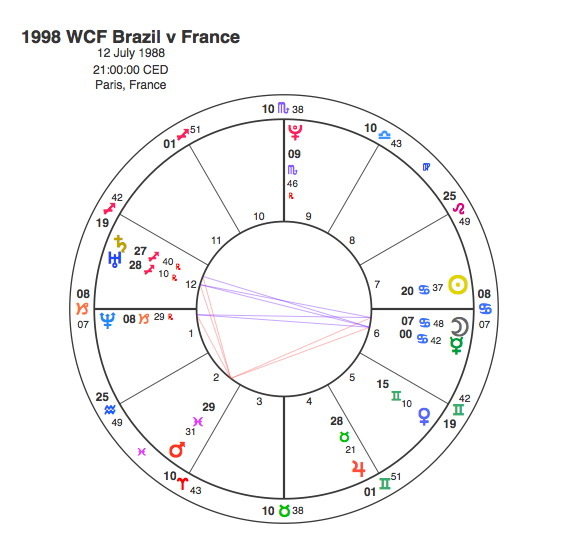 Surprisingly the World Cup hasn’t had as many shocks in the final, but a smaller scale upset was where the favourites, Brazil lost to the host nation France in bizarre circumstances was in 1988. The build-up was dominated by the fitness of Brazil’s star striker, Ronaldo, who’d had a serious knee injury. He also suffered a convulsive fit on the eve of the match. After initially being left off the team sheet, it was announced just 72 minutes before kick-off that he was going to play. There were allegations of pressure being brought to play Ronaldo from his many sponsors, but the result for Brazil was that he was a pale imitation of his usual power and strength and this seemed to affect the team badly as they lost 3 – 0 to France. 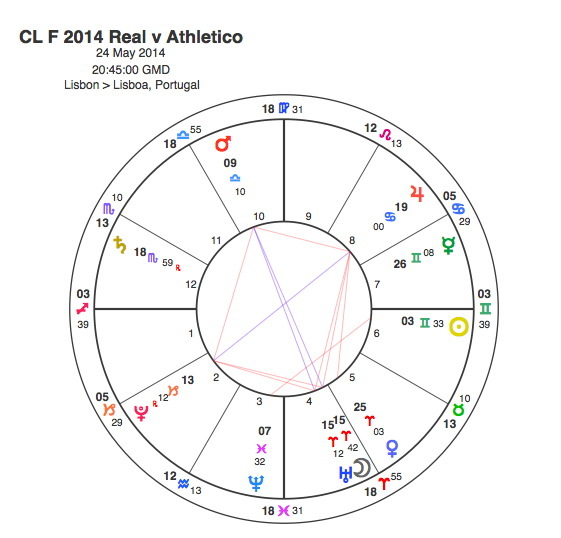 The pre match confusion is reflected in the chart with Neptune bang on the Ascendant. Saturn for Brazil was retrograde and closely conjunct Uranus suggesting that the favourites were going backwards and in for a shock. The Moon for France was in dignity in Cancer. The Moon’s movements were first to oppose Neptune showing the chaotic build up and then to conjunct the 7th house cusp giving the game to France. The only other World Cup Final that could be considered an upset was the 1950 Uruguay v Brazil. Although Uruguay were a good side, this was a shock to the Brazilians who felt it was their destiny to win as hosts in the Maracana. This one is a bit tricky. Jupiter for Brazil is in dignity in Pisces ( if we count the old rulerships ). Jupiter is at home ( conjunct the 4th cusp ) but its next aspect is opposite Saturn. Mercury for Uruguay is doing nothing. The Moon is conjunct Pluto pointing to a shock. Interestingly the Moon’s first aspect is to Neptune just as it was in the 1988 chart. As this is in Leo it could well point to a Brazilian sense of their divine destiny to win. As it is a square aspect, it shows that this was illusory. 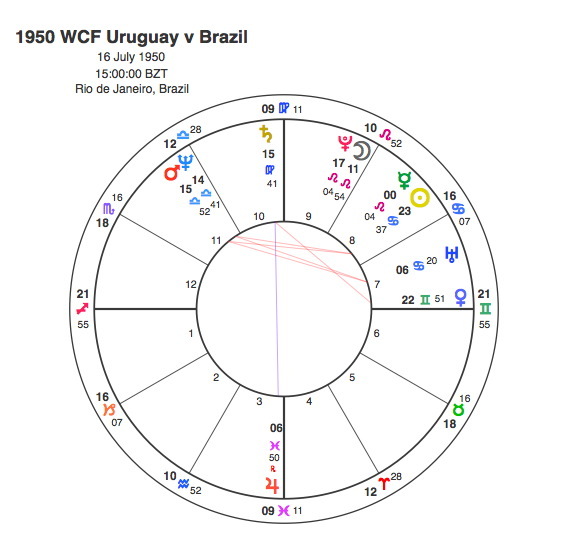 Venus is very closely conjunct the 7th house cusp and this was enough to give the game to Uruguay. One tournament where there have been a few big shocks in the final is the English League Cup. The 2011 League Cup Final between Arsenal and Birmingham was a case in point. Birmingham were fighting relegation at the time and did eventually go down that season. Arsenal were clear favourites. 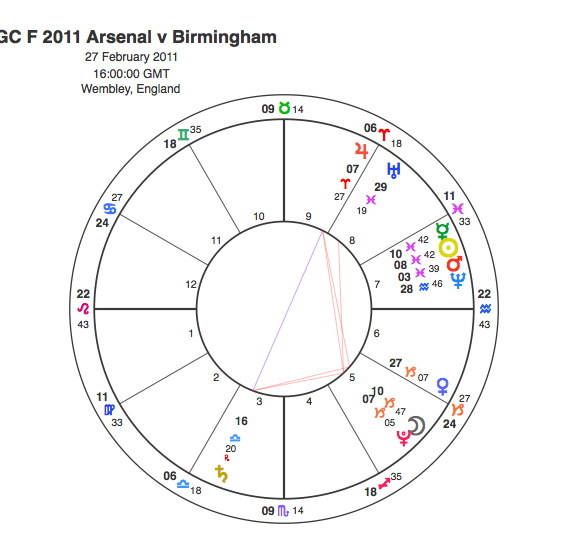 Neither the Sun for Arsenal or Uranus for Birmingham are strong in Pisces. The Moon has just left a sextile with the Sun and it continues to sextile Uranus. This is an example of a traditional astrological term ” translation of light “. The Moon is translating the light of the Sun ( Arsenal ) to Uranus ( Birmingham ) a sure sign of a victory for the underdogs. The Moon is also conjunct Pluto suggesting a shock. The 1967 League Cup Final saw Third Division QPR play First Division West Brom. QPR were appearing in their first final, while WBA were the holders and obvious favourites. Contest charts are interpreted much in the same way as Horaries and many people would say the same rules have to be applied. In a Horary when the Moon makes no aspects to any planets before leaving a sign this should be interpreted as meaning that nothing will come of the situation. We can’t apply this to a football match of course because it will obviously be completed and someone has to win. Astrologers are generally warned off trying to interpret charts with a Void of Course Moon but Capricorn Research is made of stern stuff and is undeterred. Both the Sun for WBA and Uranus for QPR are weak but Uranus is conjunct Pluto suggesting a shock. The Moon is in a T Square and although its past Uranus it is applying to Saturn. Saturn is in the following sign at 0 degrees Aries but the T Square brings all the planets involved together, so we can take this as the Moon and Saturn’s aspect being acceptable and also Saturn collects the Moon’s energy and feeds it back to Uranus. If we take traditional rulerships into account, QPR are ruled by Saturn, so a twin rulership would be Uranus and Saturn. The fact that they are both working in aspect together to take the Moon’s transit gives the game to QPR. A slight bending of the rules with hindsight here and if asked to predict it beforehand, Capricorn Research would definitely not be off down the bookies with this one. 1969 League Cup Final was between Arsenal and Swindon Town. Arsenal were a powerful force, this was the team that would do the double two years later. Swindon were in the Third Division. However, with eight Arsenal players suffering from flu (which had led to their match the previous weekend being postponed) and the pitch deteriorating badly due both to heavy rain and also being host to the Horse of the Year show the previous week, circumstances did not favour Arsenal’s short-ball game. 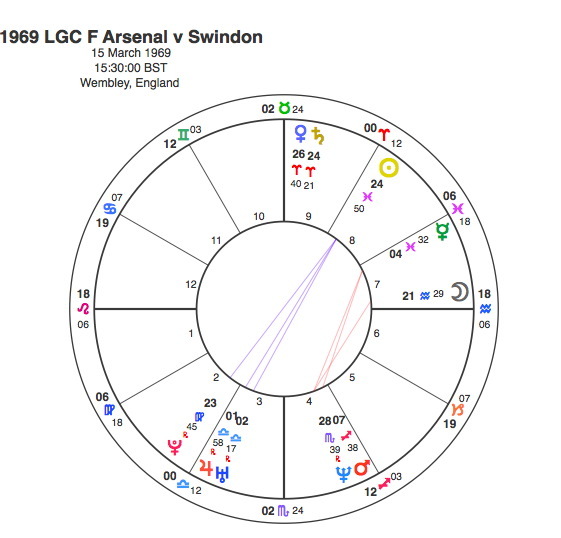 The Sun for Arsenal is weak towards the end of Pisces, a condition that fits nicely with their players being ill, and opposite Pluto threatening a shock. Uranus is also weak as its retrograde in Libra but it is closely conjunct Jupiter which has to be a good sign. The Moon makes no aspect to either the Sun or Uranus but is conjunct the 7th house cusp indicating victory for the underdogs giving the game to Swindon. 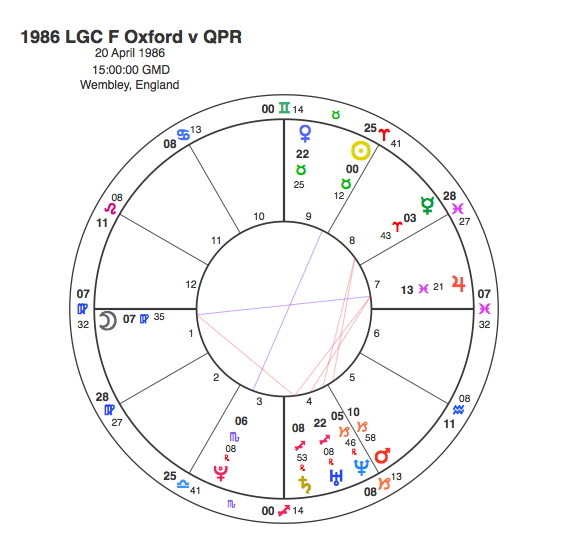 The 1986 League Cup Final was between Oxford and QPR. Oxford were fighting relegation at the time and this was to be the only major honour in their history. Mercury for QPR is doing nothing. Neptune for Oxford is retrograde. Jupiter is conjunct the 7th cusp which should give it to Oxford. The Moon makes no aspect to Mercury and has just past a trine to Neptune but the Moon, Jupiter and Neptune are part of an aspect pattern called an Easy Opposition. The Moon applies to oppose Jupiter which focuses effortlessly onto Neptune. As Jupiter and Neptune are co rulers of Pisces, the relationship is strengthened. All these factors together means Oxford win. 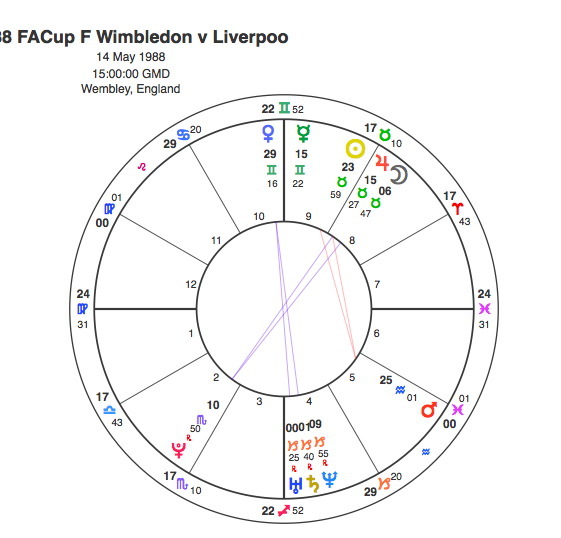 The FA Cup has produced some major shocks but perhaps the most notable one was the 1988 F A Cup Final between unfancied Wimbledon and perennial champions Liverpool. Mercury for the League champions, Liverpool is dignified in Gemini. Neptune for Wimbledon is retrograde and conjunct Saturn but this just reflected their positions in life. The Moon’s next aspect is a trine to Neptune ( Wimbledon ) and then opposite Pluto for a shock so the chart gives it to Wimbledon. In recent years the biggest shock has to be the 2013 FA Cup Final between lowly Wigan and the world’s richest club Man City. City sacked manager Roberto Mancini two days later while Wigan failed to avoid relegation from the Premier League, becoming the first team to win the Cup and succumb to relegation in the same season. Venus for City is in Gemini. 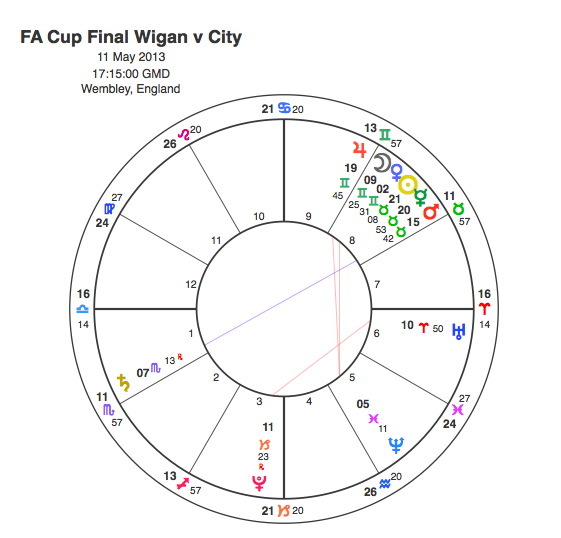 Mars for Wigan is in detriment and combust, so shows their condition as relegation candidates. The Moon does not aspect either side but is moving away from Venus, so the Cup is drifting away from City. One of the biggest shocks in the history of the final was in 1976 when Second Division Southampton beat Man United 1–0 . It was the first time Southampton had won a major trophy. 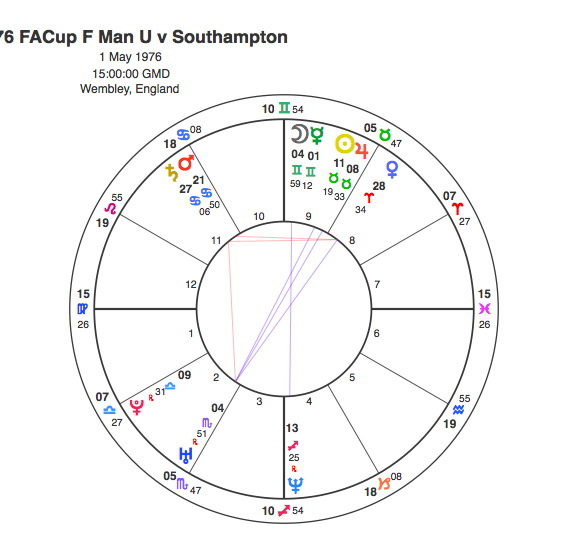 This is also a tricky one as Mercury for United is dignified in Gemini and Neptune for Southampton is retrograde at the bottom of the chart, but the state of the ruling planets just refers to the situation that the clubs are in at the time. The Moon is moving away from Mercury and inconjunct Uranus suggesting a shock which is confirmed by its next aspect a trine to Pluto. The Moon applying to oppose Neptune gives the game to the Saints. In a similar arrangement to 1976, the favourites are ruled by Mercury in dignity in Gemini and the underdogs are ruled by Neptune retrograde at the bottom of the chart. There is no question here of the outcome however as the Moon is exactly conjunct Neptune and then sextile Pluto for a shock. 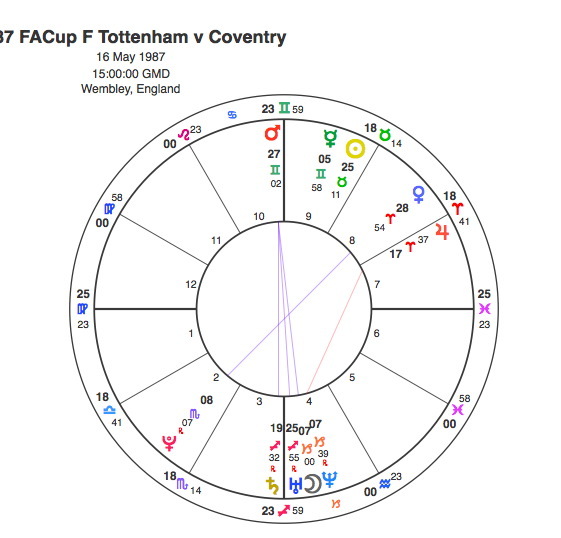 The only real shock in any of these competitions that wasn’t clearly indicated in the chart was the 1973 FA Cup Final between Leeds United, the previous season’s winners and one of the dominant teams in English football at the time, and Sunderland, then playing in the Second Division. In one of the biggest shocks in the history of the competition, Sunderland won to become the first Second Division side to lift the Cup since 1931. It remains Sunderland’s only major trophy since World War II. 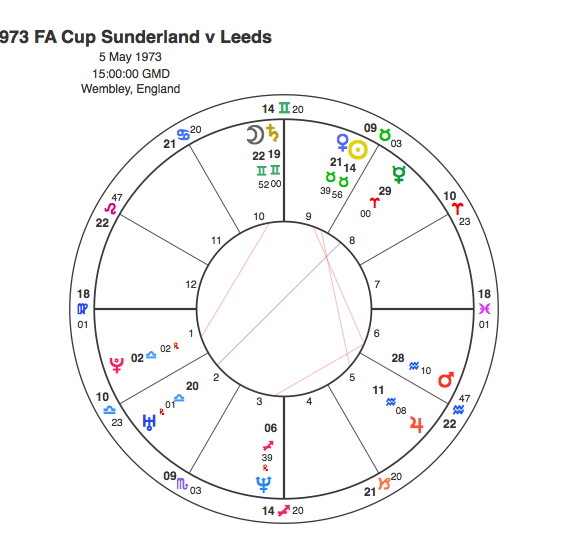 Mercury for Leeds is doing nothing and Neptune is insignificantly placed retrograde at the bottom of the chart, reflecting Sunderland’s lowly status. The Moon makes no aspect to Neptune but does make a sextile to Mercury. The only thing that might point to this upset is the fact that Mercury is at 29 degrees Aries so is fast running out of power. The Moon does not make the sextile to Mercury until they are at 29.52 of their signs, so perhaps this means that the aspect does not count. Capricorn Research will keep an eye on this type of situation in future. Of course, Contest charts are not just limited to shock results. Last weekend’s Champions league Final is a case in point. The favourites were Real Madrid, but many people were expecting a shock particularly as Athletico had won the Spanish League the previous weekend and had the upper hand in league matches against Real that season. Both Jupiter for Real and Mercury for Athletico are strong in Cancer and Gemini respectively. The Moon is conjunct Uranus and square Pluto suggesting a shock but the Moon is just past Uranus and applying to square Jupiter, which gives the game to Real. That the Moon was only 30 seconds past Uranus showed that Real left until the 3rd minute of injury time to get the equaliser. 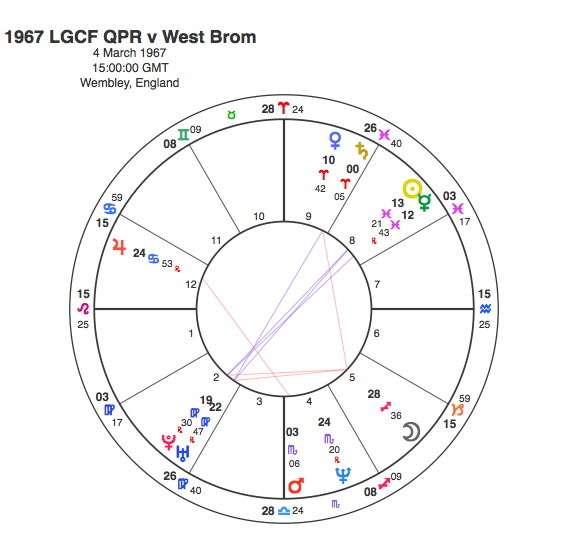 That the winner was scored by Gareth Bale was entirely appropriate as Jupiter was at 19 degrees Cancer, conjunct Bale’s Sun. And Capricorn Research predicted that Bale would score the winner in extra time a full two weeks before the match. The Contest chart does seem to be an accurate way of predicting the results of major finals, so if you’re thinking of ways to get one step ahead of the bookies, why not draw one up and follow the above rules. Better still, keep this blog on your list of favourites as Capricorn Research will share future results with the rest of the world.